This was a frustrating time and in the middle of 2001 Alesi left the team to take the opportunity to drive forJordan in place of Heinz-Harald Frentzen. In October Alesi announced that he was to retire from F1 and began looking at a career with Mercedes-Benz in the German Touring Car Championship (DTM). As part of the deal Jean was given the opportunity early in 2002 to test a McLaren-Mercedes F1 car, which he did with great gusto. 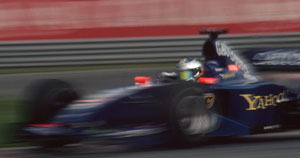 He was involved in attempts to establish a secondary Mercedes-Benz F1 team in 2005 with the Japanese sponsor Direxiv but these failed to come to fruition. He continued to race in the DTM until the end of 2006.